“Outremers be you” is an online publication dedicated to unearth talented and influential French overseas expats whatever their location around the world. Be you sends a powerful message and give you no choice than be who you are and make no apologies for it. It was a fun interview, with a Houdah, a dynamic journalist. Enjoy! This week our talent, Ghislaine is a young Martiniquan creator (or crafter) acknowledged for her craft in The Great British Sewing Bee. In England since 2000 Ghislaine took her passion for sewing to another level and proved to be one of those expat passionate about channeling overseas culture. If Ghislaine hates shopping and fitting rooms, sewing is a different matter and she proved it on national TV in England. Let’s have a chat with this creative woman proud of her talent and origins! Sewing, what does it mean to you? When you sew you can develop your own style away from stereotypes you see in shops. Body confidence, self confidence, you’re a waist measurement not a shop bought size. There is no limit to what you can create. It gives you freedom and helps you feeling good. Be you : Have you always lived in an artistic environment? Always. My family in Martinique is talented in this field. Mum always made my clothes when I was a child. One of my aunty is a professional seamstress, my sister is fantastic at crochet. One of my uncles works with Bakoua (straw hat) which he turns into fashionable hats, Ascot worthy, while another of my uncles is a cartoonist. It’s with them that I have developed skills and got interested in crafting and ultimately sewing. 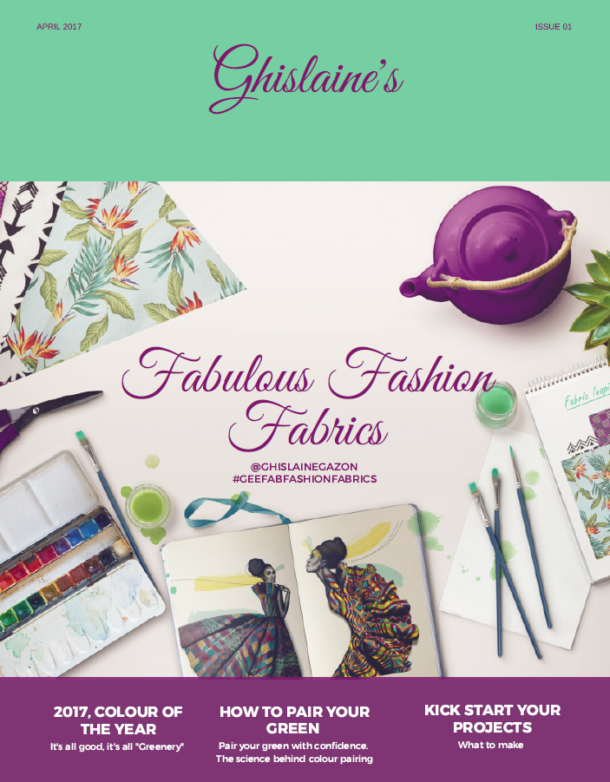 Be You : You have a natural tendency for fashion, do you have a sewing qualification? I don’t. I have always loved clothes but never admitted it. Since I was a teenager, I was interested in textiles in general, embroidery mainly. Three years ago, while working on a craft project for a friend, I needed a sewing machine to finish it off. One thing leading to another, I made 2, 3 projects with my mother, a skirt and a blouse. Later, I tried to make other outfits. I had a stained garment from a well know convenient high street retailer. I loved the dress, and grew tired of the print but I unpicked it to copy it in my chosen fabric. I since then made it in many different styles but adding trims etc. I have never stopped since then! Be You : You started sewing exactly 3 years ago. Wasn’t it too early to take part of the Great British Sewing Bee? I have always known about this program. I knew that I wasn’t fully skilled to be part of it but I decided to apply out of curiosity. I sent my application 2 days before the deadline. After two weeks they rang me and I could not believe it! The phone conversation lasted 30 minutes and I had a hard time answering the technical questions in English. I thought they would never come back to me, but I was wrong. In fact they did call back and I progressed through the stages. For the first selection, I proposed two garments which I am proud of, a denim dress and shorts in African fabric. For my level of experience it was of good quality. When I first saw the other candidates at work I realised that we were at different levels but in life you have to take risk and try. If the Production team believed in me I had to believe in myself. I was eliminated on the 2nd episode on mainly a linguistic and technical error. I learn so much doing this that I cannot regret it. I had two objectives on the show: not being eliminated first and win one of the challenges. I succeeded in both!! What’s not to be proud off! Be You : What do you think of the French version of The Great British Sewing Bee with Cristina Cordula ? The principle is the same but not the format. In France the program has 2 challenges per episode, the pattern and the customisation. In England, they have 3 challenges: the pattern, the customisation (or alteration) and the made to measure, on a real person with a very specific brief. It is harder in the UK because there are more challenges. Be You: What is your signature ? Colors and prints and my style: feminine with an urban masculine touch. I love matching a dress with silvery brogues and I adore a top-stitch – it’s a minimal detail that makes the difference!. Funny enough I don’t like jeans and trousers. Be You : Do your Caribbean origins play a role in your creations ? Absolutely, in the “Antilles” there are many colors. The blue of the sea, the green of the nature, etc. We are not afraid to wear bright colors, it’s rare to wear black. My choice of fabrics is very influenced by my background. I never buy black and I never work with a black garment. I hope my love of colours came across on the show.